"long waiting for no reason"
✅ Trip Verified | Mess, long waiting for no reason, alot of redundant stops, official are rude and always like to stamp on a freah clear page on your passport, I fly alot and have five pages with Riyadh stamp only, as if their ego is busted if they stamp a page with another stamp on it. I need to issue new passport more often becouse of that. Not Verified | I am an Indian but my parents live in Riyadh. I visit them during my holidays. To be honest Riyadh Airport is really a great airport when compared to other airports in Saudi Arabia. It uses better use of technology by employing E-immigration channels in the terminal. The staff are always kind. The only thing I feel off is that queue management in the airport is not up to the level. The toilet facilities are great. They even have Medicine Vending Machine which is very thoughtful of the Airport authorities. Overall my experience in King Khalid Int'l Airport was very nice and comfortable. I would highly recommend this airport for those who arrive and depart from Saudi Arabia. Not Verified | I always have a bad experience in Riyadh Airport. Not the crowding, it's always the officials who treat expats like labors. Very rude and unprofessional behavior, not sure what is the problem. If compared to the neighboring GCC countries, it's a different story all together. The officials should get trained in the the neighboring countries. The plan to open up Saudi for tourism will only get worse if the behavior continues. ✅ Trip Verified | I was expecting an Airport in Saudi Arabia to be decent, but to my surprise it was the worst airport I have experienced. The transit area is small, many people sitting on the floor, no cafe or restaurants only a few stands selling coffee and pastries. The staff are rude and unfriendly, no Wi-Fi for foreigners, to access the wifi you need a Saudi Arabian phone number to receive an SMS, foreign phone numbers won't work. That's happening in 2018 in an International airport! I regret so much my choice of giving a try to Saudi Arabia Airlines, the flight was ok but the transit experience was terrible. Poor countries have better airports. There is no organization, many flights board on the same gate at almost the same time, it's a total mess. My advise: even if this option is cheaper you should avoid at all costs going to this airport. "Old airport stuck in the past"
✅ Verified Review | Old airport stuck in the past where the building and infrastructure suffers from serious overcrowding and capacity issues. Check in was ok and passport control had the usual long queues. Staff attitude varies from person to person, but I think people general need to learn to smile and be friendly to be in line with other Gulf airports. ✅ Verified Review | Faced with large queues upon reaching passport control and once through it took about 45 minutes for the bags to arrive on the carousel. Clearly a badly managed airport which is still stuck in the 1980s and desperately in need of an extension and a facelift. Building is depressing and dull with no fast track for arriving Business Class travellers. One annoying thing about the airport is the taxi drivers (licenced and unlicensed) repeating "Taxi, Taxi" as soon as you reach the arrivals area past customs they always want to try to rip you off by charging a lot of money. The best and safe option is to use UBER or Careem or use the London style taxis which have a stand outside the terminal, who operate a fixed price and payment upfront policy with a receipt. "Worst airport in the Gulf"
✅ Verified Review | Worst airport in the Gulf. When travelling during peak seasons, such as Eid, always be at the airport at least 5 hours before departure, as you will be waiting at least 2 hours in the check-in queues and further 30 minutes at passport control. Had to wait 2 hours 30 minutes to check-in; as the airport was utter chaos with baggage belts in check-in counters malfunctioning and staff unorganised. 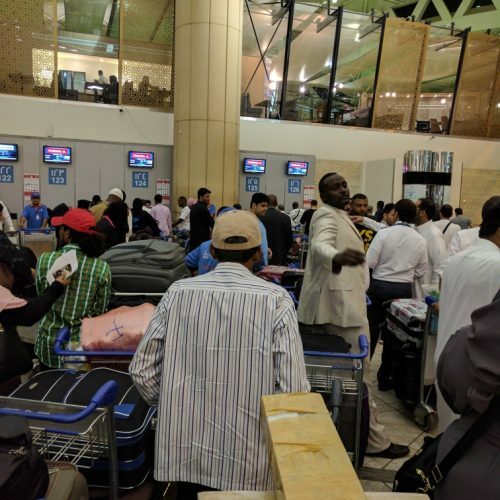 This is the same case every Eid Al Fitr and Eid Al Adha and you would think that the airport management would take a lesson from past experiences but it seems they are incompetent. The terminals for international departures (Skyteam and International Foreign Airlines Terminal) are too small to be able to handle anything especially for the amount of air and passenger traffic for a capital city. They should learn from Dubai. 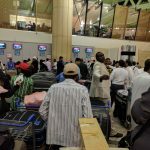 "only 20min from the plane to a taxi"
❎ Unverified | Used Riyadh International Terminal last week and, after reading past reviews, I was not looking forward to it. How wrong could I be. Immigration officers were much friendlier and more efficent than at Dubai, Doha or Abu Dhabi. Took me only 20min from the plane to a taxi. Agree that official taxis should be better signed, and all other unofficial ones better policed far and away from the airport, so better watch out. Excellent expressways allowing for fast transits from the airport to all suburbs of Riyadh. Departure also very smooth, friendly customs and passport control, good shopping opportunities, enjoyable terminal design with nice local touches, very nice & airy steel and glass business lounge "up in the sky of the terminal" with very high speed wifi, short walks to departure gates. A very good experience! ✅ Verified Review | Riyadh International Terminal is one of the worst airports I've ever seen. There is nothing like customer service. The moment you step in the airport departure, you'll feel like you step into the fish market and airport staff behaves like prisoner guard and you are the prisoner. The light is not sufficient, cleanliness is poor, trolley boys always try to find a way to loot you in terms of a tip. Airport staff don't understand English and don't give respect passengers. Physical space is very limited for an international boarding lounge. ❎ Unverified | The major problem with this airport was the waiting time to receive my boarding pass. The lines at the Etihad ticket counters were long, and there was no organization. There were no roped stanchions. Some travelers cut in front. It was very frustrating and unpleasant. 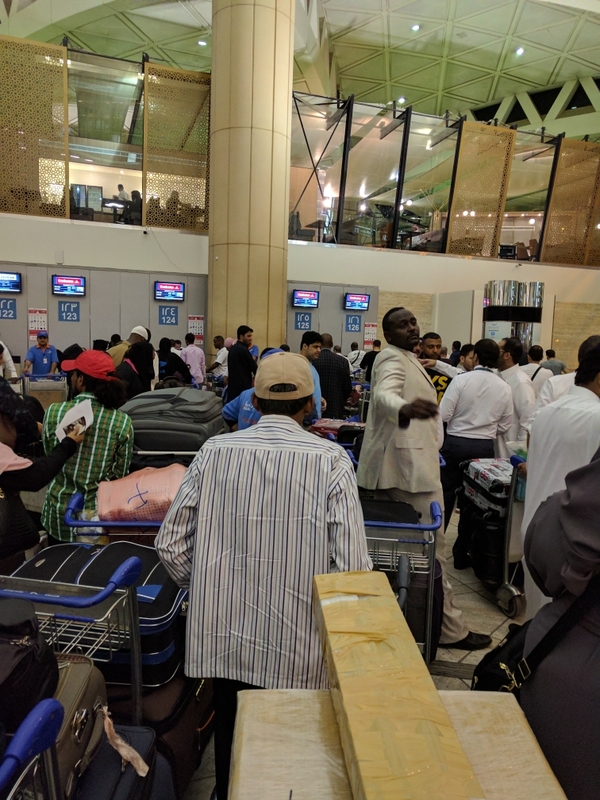 A secondary problem with the airport is the numerous taxi drivers waiting to bring returning travelers into Riyadh. Many of them are rogue and do not have permission to work as drivers: they should not be permitted in the airport area. Also, the official taxi stands should be better marked. The inside of the airport has adequate shopping, cafes, and other amenities. The problem is with arriving/departing.